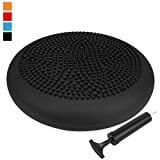 Exercise disc balance cushion, wobble cushion, fitness stability pad, balance Board, wobble board air balance cushion, balance disc or balance cushion is an inflatable round cushion . It can reduce physical instability, fatigue and pain, improves energy levels for an improved active lifestyle, improves concentration for adults and children and also improves the ability to manage stress. Targets the abdominal core muscles, cardiovascular system, legs, glutes, and improves balance. Durable enough to withstand repetitive use: Our wobble cushion is strong enough to sit and stand on with the benefits of an unstable surface. It is eco-friendly, free of phthalates and heavy metals, textured, slip-resistant, and was made of professional grade anti-burst material. The unique butterfly pattern is specially designed to regulate massage intensity, which efficiently provides relief from pain and helps to recover the vitality. It is used primarily to: Improve proprioception after injuries or surgery involving the leg; Strengthen the core stability muscles to help decrease back pain; Help children sit and concentrate in class. Our balance cushion can be used to improve proprioception include: sprained ankle, arthritis, knee anterior cruciate injury, after knee anterior cruciate surgery, after knee meniscus (cartilage) surgery, following joint replacement surgery, collateral knee ligament injury. Size: Diameter -34cm/13.4inch , Height-4cm/1.57inch. Color: Blue/black/green/purple. Diameter-35cm/13.8inch, Height-9cm/3.54inch. Color: Blue/black/red/orange. The maximum weight for this product is 200kg, which is equivalent to 32 stone.